WHAT ABOUT EATING NO FOODS? We have been discussing FOODS. In the FOODS- STRATEGIES' section, the EDITORS briefly discussed how they avoid certain foods. One of the EDITORS follows Dr. D'Adamo's Blood-Type Diet. Another EDITOR follow Dr. Clark, and avoids foods that gives parasites, associated with cancer, their sustenance, in order to help starve them.. But what about eating NO foods? Dr. Simon Yu related a very unusual patient case of a man who embarked upon a forty day fast.. "Is it possible that a 40 day fast might be a way of eradicating parasites? Parasites might leave the body when there is no food available for them or they may transform into a dormant cyst like cocooning and wait to re-grow when the conditions are right. .... Maybe a 40 day fast eradicates parasites and rejuvenates the body and spirit." A forty day fast is way, way too extreme. Are there short, intermittent fasts to heal the immune system and the spirits? 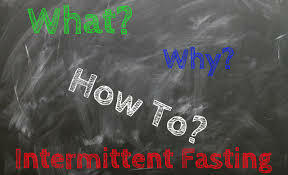 * DOES 2-4 DAYS FASTING, MULTIPLE TIMES, OVER SIX MONTHS HELP REGENERATE THE IMMUNE SYSTEM? YES!! with the chemotherapy drug, cyclophosphamide. and reduce the death rate of the mice. ​ the overall fluid and calorie intake of the patients." Jalees Rehman, 2014, http://www.scilogs.com/next_regeneration/fasting-improves-recovery-of- bone-marrow-stem-cells-after-chemotherapy/. "During fasting, the number of hematopoietic stem cells increases, but the number of the normally much more abundant white blood cells decreases. In young or healthy mice undergoing multiple fasting/re-feeding cycles, the population of stem cells increases in size although the number of white blood cells remain normal. In mice treated with chemotherapy or in old mice, the cycles of fasting reverse the immunosuppression and immunosenescence, respectively." Worrying about chemotherapy toxicity? Want to heal your immune system? In Cheng C-W et al. 's 2014 study, participants fasted for two-to-four days, in multiple cycles, over a six month period. The result? A new immune system! These multiple cycles of fasting halted the damaging effects of chemo or any other deleterious agent on the immune system and reversed the damage. The fasting "reduces IGF-1 (insulin-like growth hormone) and PKA (needs to be shut down to trigger regeneration) activity in various cell populations," that led to the stimulation of stem cells and the building of a new immune system. These "prolonged fasting cycles promote hematopoietic stem cells' self-renewal to reverse immunosuppression." ​ (See Chia-Wei Cheng et all, Prolonged Fasting Reduces IGF-1/PKA to Promote Hematopoietic-Stem-Cell-Based Regeneration and Reverse Immunosuppression,CellStemCell, 2014). 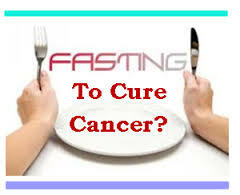 * DOES PROLONGED NIGHTLY FASTING REDUCE BREAST CANCER RISK? In the Marinac CR et al. 2015 study, "The objective was to investigate whether prolonged nightly fasting is associated with reduced A1c and postprandial glucose concentrations, and thereby reduced risk of breast cancer." Indeed, "Each 3-hour increase in nighttime fasting was associated with a 4% lower 2-hour glucose measurement." ​ "To our knowledge, this is the first study to document that a longer nighttime fasting duration in women was significantly associated with improved glycemic regulation and putatively with reduced breast cancer risk. Large-scale randomized trials are needed to confirm whether a habitual prolonged nighttime fasting regimen results in favorable changes in biomarkers of glycemic control and breast cancer risk. If these findings are confirmed, recommendations for prolonged nightly fasting could be provided as a simple and understandable guideline." In Marinac CR et al. 's 2015 study, the researchers "examined associations of of nighttime fasting duration with biomarkers of breast cancer risk among women in the 2009-2010 US." Here is a Science News summary of the study: "A decrease in the amount of time spent eating and an increase in overnight fasting reduces glucose levels and may reduce the risk of breast cancer among women, report researchers. Women who fasted for longer periods of time overnight had significantly better control over blood glucose concentrations. The data shows that each three hour increase in nighttime fasting was associated with a 4 percent lower postprandial glucose level, regardless of how much women ate." The study concluded, "A longer nighttime duration was significantly associated with improved glycation regulation." * DOES PROLONGED NIGHTLY FASTING REDUCE BREAST CANCER RECURRENCE IN EARLY BREAST CANCER? Excerpts from an Eureka Alert article: In the Marianc CR et al. 2016. researchers found that fasting in early breast cancer patients less than 13 hours is "associated with a 36 percent higher risk for breast cancer recurrence compared with fasting 13 or more hours per night". Note that shorter fasting periods were not associated with higher mortality.
" 'Our study introduces a novel dietary intervention strategy and indicates that prolonging the length of the nightly fasting interval could be a simple and feasible strategy to reduce breast cancer recurrence. In this cohort of patients with early-stage breast cancer, a longer nightly fasting interval was also associated with significantly lower concentrations of HbA1c and longer sleep duration. Given the associations of nightly fasting with glycemic control and sleep, we hypothesize that interventions to prolong the nightly fasting interval could potentially reduce the risk of type 2 diabetes, cardiovascular disease and other cancers. Thus, findings from this study have broad and significant implications for public health. Randomized trials are needed to adequately test whether prolonging the nightly fasting interval can reduce the risk of chronic disease,' the authors conclude." For the Eureka alert article, see http://www.eurekalert.org/pub_releases/2016-03/tjnj-pnf032916.php. For the study, see Marianc CR et al., Prolonged Nightly Fasting and Breast Cancer Prognosis, JAMA ONcol, 2016. 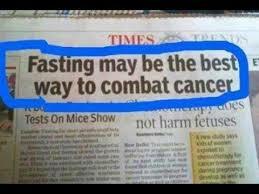 * WHY IS FASTING BENEFICIAL? "The blood glucose concentration can be lowered by 20-40% during fasting. We calculated that glucose supply to the potentially hazardous anoxic (without oxygen) cells can thereby be reduced significantly, resulting in cell death specifically of the anoxic tumor cells. We hypothesize that intermittent fasting will help to reduce the incidence of tumor relapse via reducing the number of anoxic tumor cells and tumor awakening." In the 2015 Lankelma J et al. 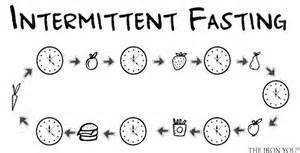 study, the researchers explored the underpinning reason as to why intermittent fasting is beneficial. Tumors readily become oxygen depleted, resulting in tumors that have anoxic - low oxygen -cells. "These cells are dangerous, because they are capable of inducing angiogenesis, which will 'wake up' the tumor. Anoxic cells are dependent on anaerobic glucose breakdown for ATP generation." With fasting, the researchers determined that the glucose concentration can be lowered 20-40%, Therefore, the "glucose supply to the potentially hazardous anoxic cells can be reduced significantly,, resulting in cell death, specifically of the anoxic tumor cells. We hypothesize that intermittent fasting will help to reduce the incidence of tumor relapse via reducing the number of anoxic tumor cells and tumor awakening."